KIEV, Ukraine -- Russia’s hybrid war against Ukraine is now entering its fourth year, but there was a time when few expected it to last even four weeks. A girl gives a flower to a new volunteer of the Ukrainian interior ministry's special battalion "Sich" during a ceremony, where he and his comrades will take an oath of allegiance to the country, in Kiev August 26, 2014. The virtually bloodless seizure of Crimea, which fell to Russian troops in early 2014 without a fight, led most observers to conclude that Ukraine was effectively defenseless and at Moscow’s mercy. This was the consensus view in Moscow, where many of the bolder voices began speaking of celebrating the traditional May holidays in Kiev itself. Such swagger seemed perfectly reasonable; Ukraine was still reeling from months of anti-government protests that had spread chaos across the country before culminating in the flight of President Viktor Yanukovych and the collapse of his entire administration. The interim Ukrainian government that hastily replaced Yanukovych’s administration lacked constitutional legitimacy and was in no position to risk a military confrontation with the mighty Russian Federation. A clear window of opportunity had opened for Moscow to reassert itself in mainland Ukraine. Encouraged by the stunning success of his initial gamble in Crimea, President Vladimir Putin decided to raise the stakes and take arguably the biggest risk of his entire career. The subsequent operation that unfolded in March and April 2014 envisaged the conquest of half of Ukraine through a series of localized uprisings supported by hybrid Russian forces. Leaked telephone conversations and hacked emails of senior Kremlin advisers, including Vladislav Surkov and Sergey Glazyev, have since provided considerable detail on Russia’s efforts to seize control of regional administrations in key Ukrainian cities throughout the south and east of the country, including Dnipro, Kharkiv, Kherson, and Odessa. These leaks track closely with the events that took place on the ground in Ukraine during that turbulent spring. For a few precarious weeks, Ukraine’s chances of survival as an independent state appeared to be rapidly receding. However, the much-feared Russian march to the Dnipro never materialized. Instead, Russian uprisings were stifled across southeast Ukraine, and the Kremlin found itself restricted to a small bridgehead within the boundaries of Donetsk and Luhansk oblasts in Ukraine’s easternmost borderlands. Three years on, they are still there, stuck in a quagmire of their own making. Why did Putin’s ambitious plans for a new empire in mainland Ukraine fall so dramatically short of expectations? Perhaps understandably, Russian planners underestimated Ukraine’s capacity to fight back. Ukraine had only 6,000 combat-ready troops available in spring 2014. This was a ridiculously threadbare force that was incapable of protecting the country’s borders, never mind defending its towns and cities. What Moscow failed to anticipate was the wave of patriotic emotion that surged across Ukraine in the wake of Russia’s hybrid assault. 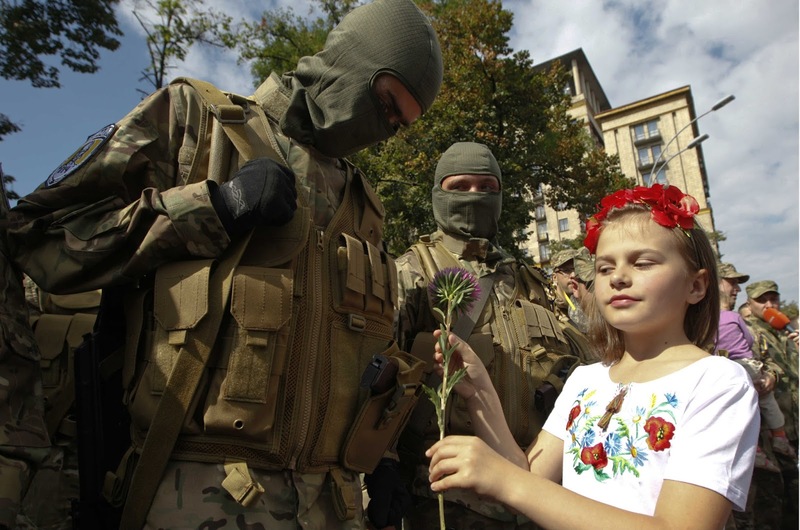 Thousands of Ukrainians took up arms in the spring of 2014, forming volunteer battalions that bolstered the country’s paper-thin defenses and stopped the Russian advance in its tracks. Behind them stood an army of civilian volunteers who provided improvised logistical support in the form of everything from food and uniforms to ammunition. This military miracle saved Ukraine and left the Kremlin in its current predicament. It is hardly surprising that Russia failed to predict the backlash its attack would provoke. Since the collapse of the Soviet Union, the Kremlin’s Ukraine policy had been driven by a toxic and self-defeating blend of wishful thinking and colonial condescension. This approach became increasingly entrenched during Putin’s reign; he made no secret of his desire to reassert Russian hegemony throughout the former Soviet Empire. In this revanchist worldview, Ukraine’s separation from Russia was artificial, while the entire settlement of 1991 was a grave historical injustice. These beliefs were by no means limited to the upper echelons of the Kremlin. Many in Russia still struggle to accept the reality of Ukrainian independence, seeing the country as a core component of a greater “Russian world” that is centered on Moscow. Kiev was the center of the Kievan Rus civilization that today’s Russia and Ukraine both see as their predecessor, while the Russian Orthodox Church traces its origins to Kiev and the tenth century conversion of the Eastern Slavs to Christianity. This makes many in Russia prone to blaming any manifestations of Ukrainian national identity on a radical nationalist minority. As a new generation emerged in Ukraine with no personal experience of the shared Soviet past, Russian policymakers consistently refused to acknowledge changing tides of opinion or recognize the growing importance of Ukrainian identity. Famously, they have attributed Ukraine’s two post-Soviet popular uprisings almost exclusively to insidious Western influences, despite the decisive role played by millions of ordinary Ukrainians in both the 2004 Orange Revolution and the 2014 Euromaidan. These comforting fictions led Russia to the disastrous miscalculations of the Novorossiya campaign. Based on its own carefully curated vision of Ukraine, there was every reason to expect a warm welcome when Kremlin agents seized control of entire regions and began calling for Russian military support. When this welcome did not materialize, Russia placed the blame on a motley crew of phantom fascists, CIA agents, and other international villains. In reality, the Kremlin had failed to appreciate the strength of the Ukrainian national spirit—especially among the country’s millions of Russian-speakers and those with no ethnic Ukrainian heritage. This failure was the direct result of decades of Russian denial about Ukraine. Russia’s Novorossiya project has plunged the world into a new Cold War and caused untold suffering to millions of Ukrainians, but it has also consolidated Ukraine’s sense of national identity and hastened the psychological split with Russia begun in 1991. Putin’s hybrid attack was supposed to end what many in Moscow continue to see as the aberration of Ukrainian independence. Instead, it has cemented Ukraine’s place on the European map after centuries in Russia’s shadow.